The head of the Russian Olympic Committee (ROC), Alexander Zhukov, recently announced the completion of nearly all Sochi Olympics infrastructure and invited President Vladimir Putin to a series of test events. At a meeting with the president, Zhukov remarked that this year would be the start of many test events held at Olympic venues in Sochi — some at the very highest level and, in particular, the Figure Skating Grand Prix in December. 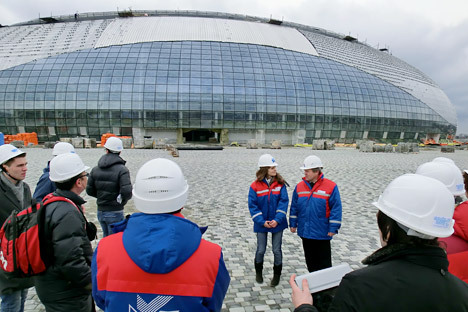 “Do you think all the facilities will be ready?” President Putin asked the ROC head. “The infrastructure, too, is just about ready. The new railway should soon become operational. Highway construction is nearing completion. They are, perhaps, the most important projects,” Zhukov said. “Let's go. I haven't been there for a long time. Let's go and see,” said Putin. Zhukov responded by inviting the head of state to attend the test events. “I think it will be very interesting. They begin in December. There'll be very many of them in January and February. In fact, there'll be test events at a very high level throughout the season. You're welcome to come and take a look,” Zhukov said to Putin. In Zhukov's words, Russia has seen the appearance of many talented young athletes, and he expressed the hope that this coming season would be a very important step toward preparing for the Sochi games. “Almost all the Olympic venues will host test events at a very high level. It is extremely important that athletes have an opportunity right now to train for the Olympics at the actual venues,” said Zhukov. Training is underway at the bobsled track, the downhill ski slopes were ready last year, and the cross-country ski tracks and biathlon stadium will be fully utilized this year, according to the head of the ROC. “The teams and athletes are following their individual training schedules, and we consider these test events to be the most important stage of preparation ahead of the Olympics,” Zhukov said. Zhukov also mentioned that the Olympic Lessons in Schools program was launched last year, and more than a thousand lessons have already been held with the involvement of top athletes and Olympic champions. “I've taken part in these sessions more than once. When children see Olympic champions and athletes in the flesh, their eyes sparkle. I'm sure that after such an experience many children will take up sports and exercise,” he said. Furthermore, a special primer on the history of the Olympics has been prepared for schools, added the ROC head. He says that the program will continue. “We are now starting another program for mainstream sports fans to set up 'fan zones' in different cities at major events,” said Zhukov. The fan-zone program was tested for the first time during the London Olympics. “It worked very well: people gather together at stadiums to watch live broadcasts on giant screens and cheer on the athletes. I think it’s a great tool to promote sports,” Zhukov said. The article is abridged and first published in Russian in RIA Novosti.